Anyway, suffice to say that I’m quite enjoying knitting Bedford, and thanks to the cold weather I’m feeling very motivated to get it finished. So far my mods have been pretty simple. I added 1.5 inches to the length (and I suspect to get another inch or so through blocking/wearing). I’m also knitting the sleeves inside out. They’re meant to be reverse stockinette, but my gauge is much more consistent when I knit (I don’t tend to have loose purl stitches, but the motion tires my hands out faster, which can lead to looser stitches here and there). So, I decided to knit them in stockinette in then just flip them right-side-out when it comes time to join them to the body. I knit the ribbing opposite to how it’s written to make up for it, and since I’ve been alternating skeins every two rows, I’ve had my extra yarn hanging on the outside of the knitting (it’s weird at first, but you get used to it). The fabric is kind of folded right now, but that should block right out. Before I actually join everything together, have I neglected to think of something here? 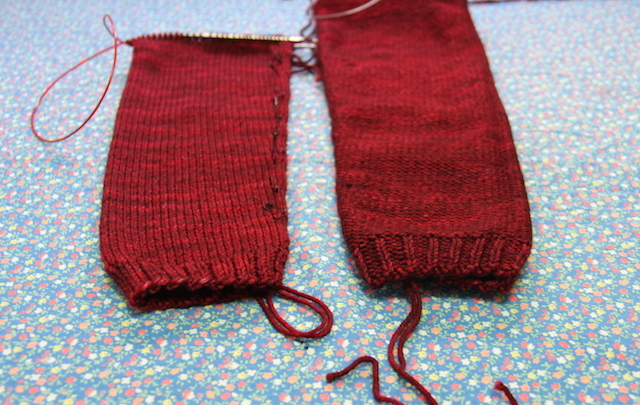 When I looked through the project pages it seemed not one else knit the sleeves this way, which may mean they just stuck to the pattern or may mean there’s a good reason not to, I’m not sure. But, I figured that some people knit sleeves in the round when the pattern says to knit them flat, and some people prefer to pick up stitches and knit sleeves top down instead of seaming, so there’s precedent for changing things up. The other mod I’m considering has to do with the raglan lines (though not the decrease rate, which will be a game-time decision I think). As I’ve been knitting this I’ve been worrying a little about the weight. The sweater was designed for Loft, which is an airier yarn than the Tosh Vintage I’m using. I’m happy for the sweater to grow a little, but I don’t want the shoulders and neck to end up misshapen as a result. 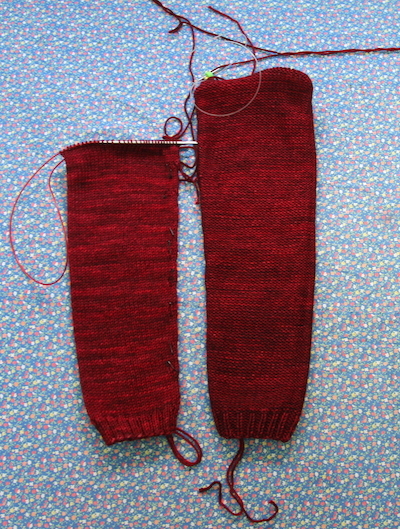 There are seams at the underarms, and the neck ribbing is picked up, but I want t reinforce the raglans too. I was planning to use single crochet on the inside (which I did on my Woodstove Season cardigan), but then Karen Templer posted about adding seams to a seamless sweater and I’m wondering if maybe that’s a better bet. It would be easy enough to add a purl stitch to the centre of the raglan lines, to be seamed away later, and it certainly sounds sturdy. I’m not quite there yet, so I have time to think about it. Have you ever had to add structure to an otherwise seamless sweater? What’s your favourite method? *The title of this post is because I get the sense there is going to be a lot of red in 2015. 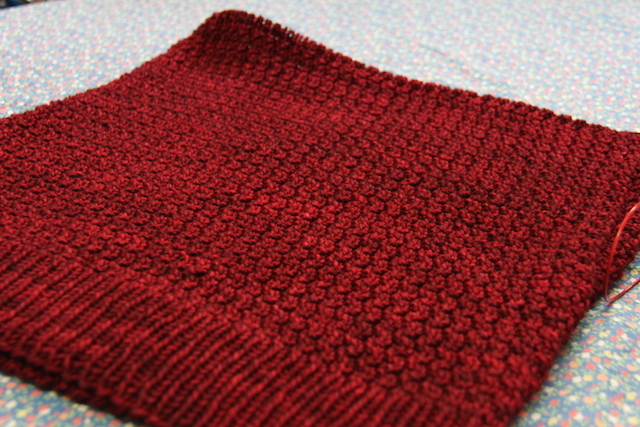 Between the baby sweater, this sweater, Halligarth (which I plan to reacquaint myself with soon), and at least one pair of socks I have planned, it seems I have red on the brain. There are worse colours to be obsessed with though, right? Beautiful work here. I have no clue how to add structure to a seamless gansey. Please show via pics what you end up doing. Red is awesome. 😀 Go for it! The color is gorgeous, can’t wait to see it finished (which shouldn’t be long at the rate you’re going, ha)! You are right, there are worse things than being obsessed with that beautiful red. Good luck on all the mods, looks wonderful so far!